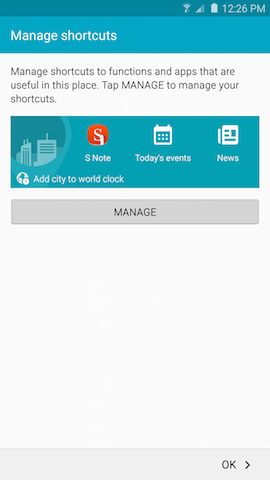 [Galaxy Note 5] How to use location-based services in "My Places" widget? The My Places widget lets your device recognize your location to provide relevant information and services. Add places such as Home, Work, and Out and about using Maps, Wi-Fi, or the Bluetooth® feature to recognize locations. For example, set your Home location using Maps to search for your location. 1. 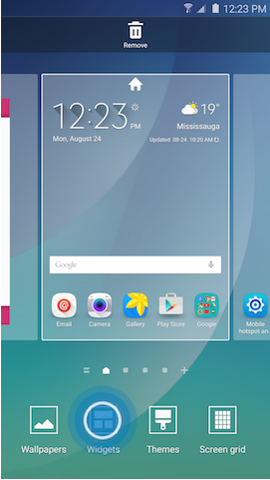 Touch and hold the Home screen, and then touch Widgets at the bottom of the screen. 2. 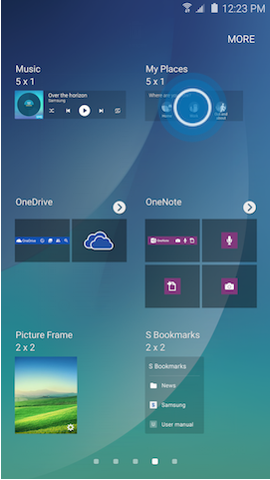 Touch and hold the My Places widget, position it on an available screen, and release it. 3. Touch Back to exit the edit mode. 4. 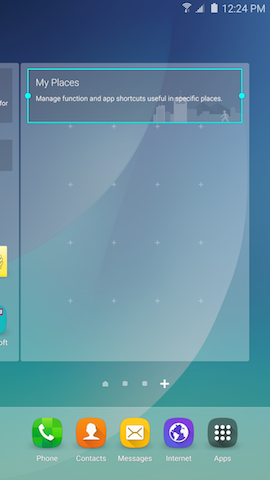 Touch the My Places widget. 5. Touch a location to define it. For this example, touch Work. 6. Your current location will appear under Address. Touch to search for your location again. 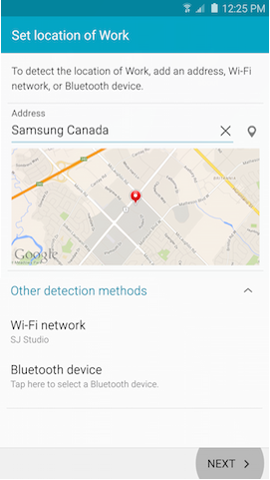 Touch Other detection methods to define your location using a Wi-Fi network or Bluetooth device. 7. Follow the steps for the method you choose. When using Maps, you will need to search for your location or use the current GPS coordinates. When using Wi-Fi, you will be asked to select the Wi-Fi access point. When using the Bluetooth feature, you will be asked to select the device from a list of available devices. 9. 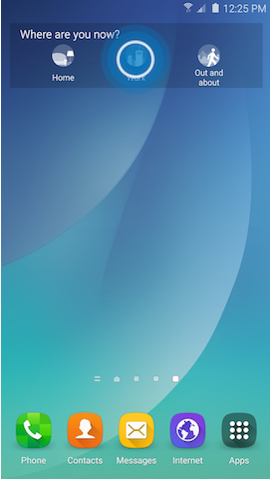 Touch MANAGE to manage shortcuts to functions and applications that are useful in this location, or touch OK to continue. 10. 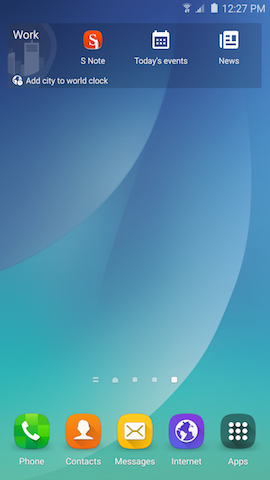 Your device will recognize this location and display the selected shortcuts in the My Places widget. 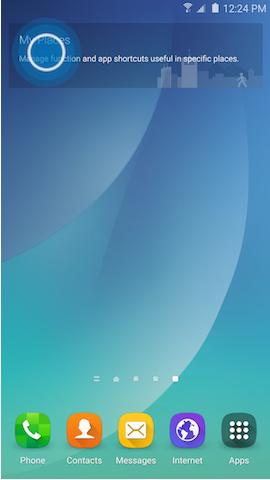 Touch an empty area of the widget to access additional options. [Galaxy Note 5] How to force restart the device? When the S pen gets detached, the floating icon always appears on the screen. 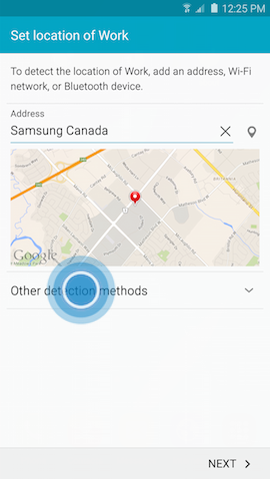 [Galaxy Note 5] What Location settings (GPS) are available?